Use Tripp Lite B090-A9F-X to connect Servers to Tripp Lite B092-016 and B096-048 Console Servers. Requires inexpensive Cat5/Cat6 patch cables between adapter and console server RJ45 ports. 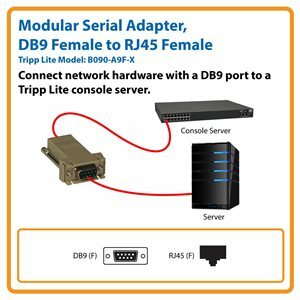 Tripp Lite’s B090-A9F-X Modular Serial Adapter features crossover wiring to let you connect a network server with a DB9 serial port to a Tripp Lite B096-048 console server. One end of the adapter features a DB9 female connection, while the other end has an RJ45 female connection. With this adapter, you will be able to connect a server with a serial port and monitor it over IP through your console server. The connection also requires an inexpensive Cat5/Cat6 patch cable between the adapter and the console server’s RJ45 port. The B090-A9F-X has rugged metal slotted thumbscrews so you know your components have a secure connection at all times. For peace of mind, the B090-A9F-X comes backed by a lifetime warranty. It’s manufactured in compliance with strict RoHS specifications, reflecting Tripp Lite’s commitment to environmental responsibility. Your Tripp Lite adapter will be shipped to you in its original Tripp Lite packaging (poly bag with Tripp Lite logo; see photo). This is your assurance that the product you purchase will deliver the superior performance you expect. And if you don’t see this packaging, it’s not a genuine Tripp Lite product!